A newer technique is disc replacement. The procedure involves removing the disc and replacing it with artificial components, similar to what is done in the hip or the knee. This lets the segment of the spine keep some flexibility and hopefully maintain more normal motion. Recovery time may be shorter than with spine fusion because the bone does not have to solidify. Although disc replacement has been used in Europe for a number of years, it has only recently been used in the United States. Early results are promising. 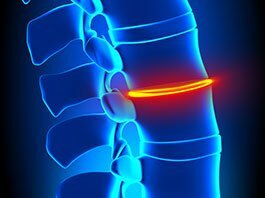 Currently disc replacements are done through an anterior approach, and are primarily done on the lower two discs of the lumbar spine.